The key elements of passive design are: building location and orientation on the site; building layout; window design: insulation (including window insulation); thermal mass; shading; and ventilation. Each of these elements works with others to achieve comfortable temperatures and good indoor air quality, retrofitting of insulation difficult. 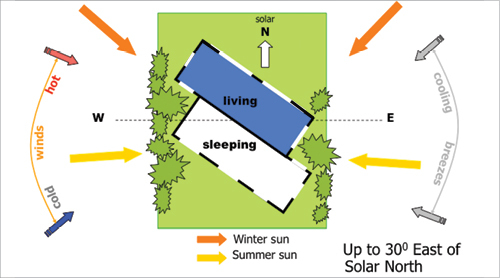 The first step is to achieve the right amount of solar access – enough to provide warmth during cooler months but prevent overheating in summer. This is done through a combination of location and orientation, room layout, window design and shading. Insulation and thermal mass help to maintain even temperatures, while ventilation provides passive cooling as well as improving indoor air quality.All of these elements work alongside each other and therefore should be considered holistically. For example, large windows that admit high levels of natural light might also result in excessive heat gain, especially if they cast light on an area of thermal mass. Similarly, opening windows that provide ventilation will also let in noise. While ventilation provides passive cooling as well as improving indoor air quality. 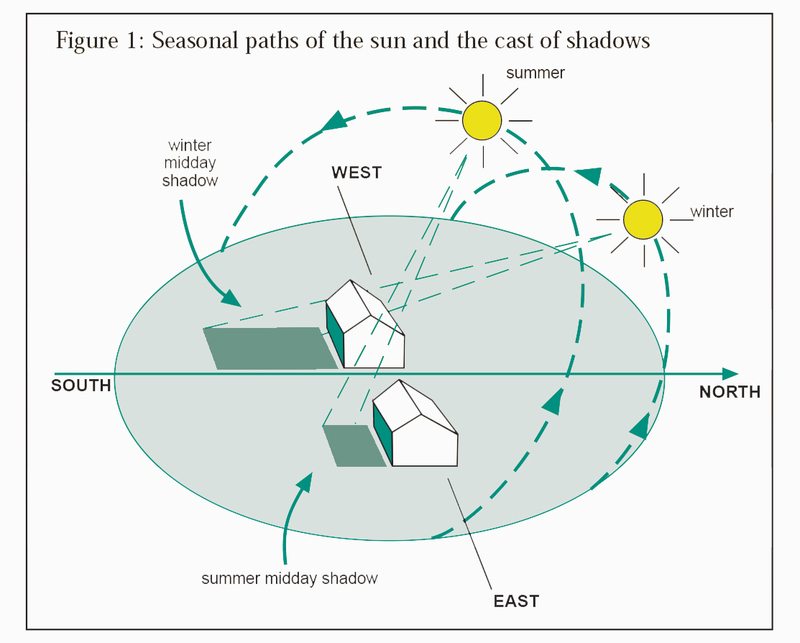 Orientation is the positioning of a building in relation to seasonal variations in the sun’s path as well as prevailing wind patterns. Good orientation can increase the energy efficiency of your home, making it more comfortable to live in and cheaper to run. 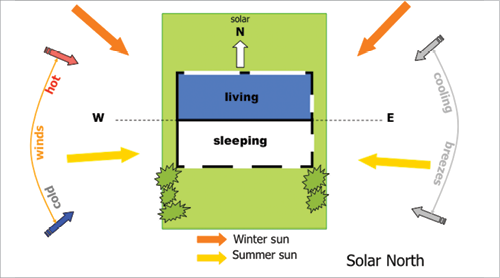 Orientation for passive heating is about using the sun as a source of free home heating by letting winter sun in and keeping unwanted summer sun out — desirable in the majority of New Zealand homes. 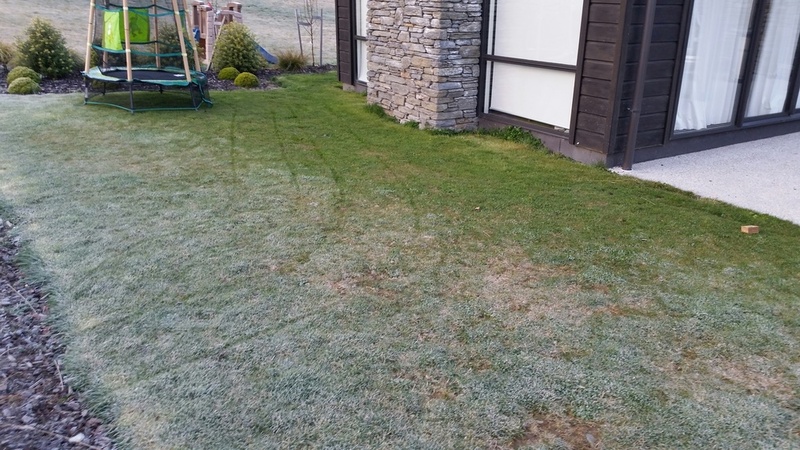 It can be done with relative ease on northern elevations by using horizontal shading devices to exclude high angle summer sun and admit low angle winter sun. 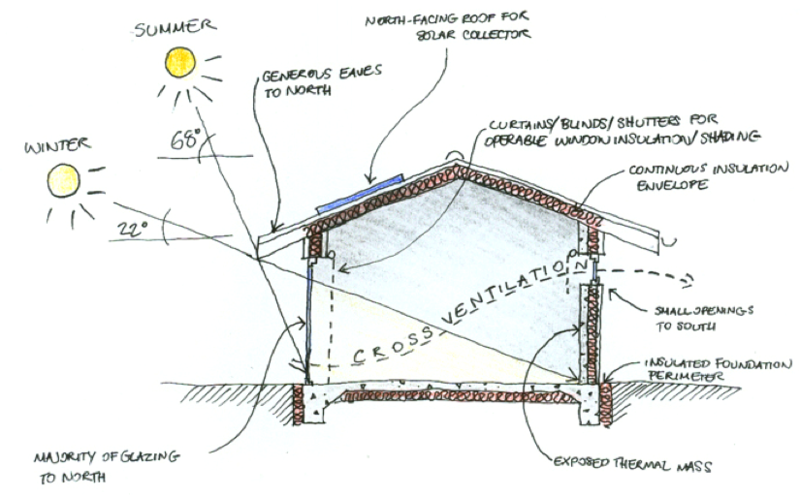 You can achieve good passive solar performance at minimal cost if your site has the right characteristics. Where possible, choose a site that can accommodate north-facing daytime living areas that flow to outdoor spaces with similar orientation. 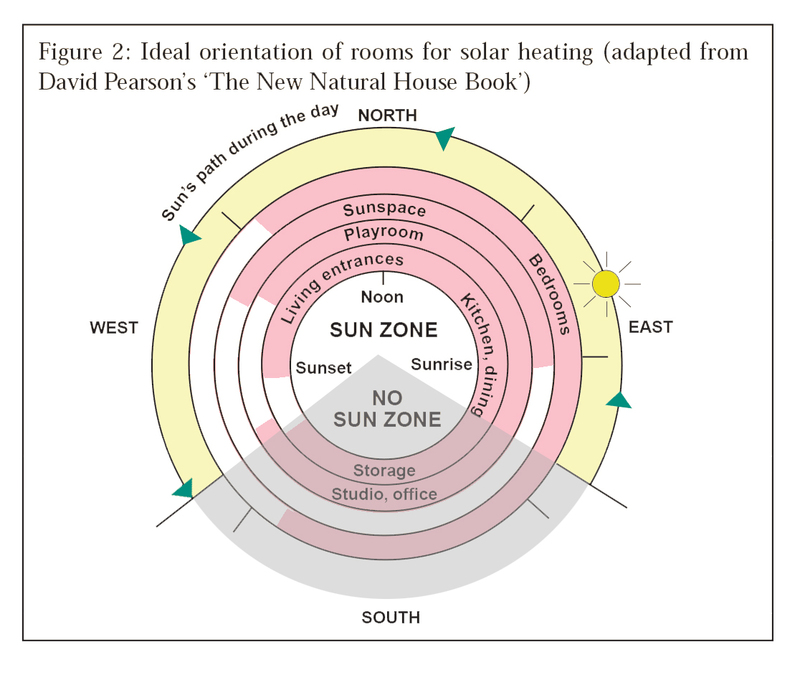 In tropical areas, northerly solar access is not desirable: sites that allow maximum exposure to cooling breezes and designs that draw or funnel them through the building are preferable. This simple following configuration allows for passive heating of living areas during the day and cooler, southerly sleeping area. Insulation is not a source of heat, it acts as a barrier to heat flow, reducing heat loss in winter to keep the house warm or reducing heat gain in summer to keep the house cool. 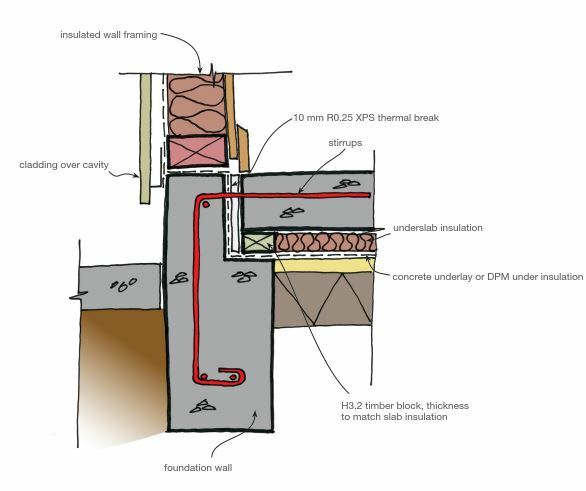 Inadequate insulation and air leakage are the main causes of heat loss in homes. Current building codes specify only a minimum level of insulation that may be less than the optimum for heat conservation. Installing insulation above the building code requirements is beneficial, especially in colder climates. When thinking about insulation, it’s important that you think of all the following areas: Ceiling, under the floor, walls, windows. These four areas form the ‘thermal envelope’. The thermal envelope is the barrier between heated and unheated spaces. (Here in pink) It protects the inside of the home from the outside climate. The better insulated your thermal envelope is, the warmer your home will be. It is primordial to keep the thermal envelope continuous, to avoid any thermal bridges (Where the heat will escape). 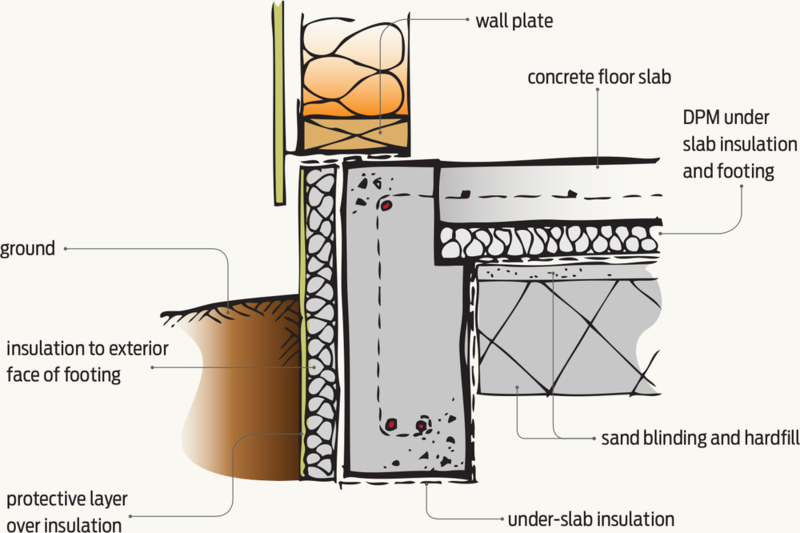 One of the key element of the thermal envelope would be to insulate the edge of your concrete slab. 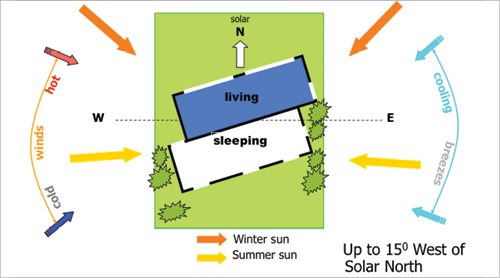 Reasonably large areas of northern glazing (windows/skylights) are required to collect solar heat in winter. A maximum of 50% of the north facing wall should be glazed to avoid any overheat. West-facing windows can cause late afternoon overheating at any time of the year. They should be shaded on the outside of the home in summer. Easterly windows help early morning warming and can be a little larger than westerly windows. South facing glazing should be kept to the minimum required for ventilation. It is very important that the total area of northern windows is balanced with the amount of thermal mass available to absorb the heat. Glazing is also the biggest area of heat loss. Good to know: the Resistance (R-value) of a window results of the combination for the R-value of the frame and the R-value of the glass. 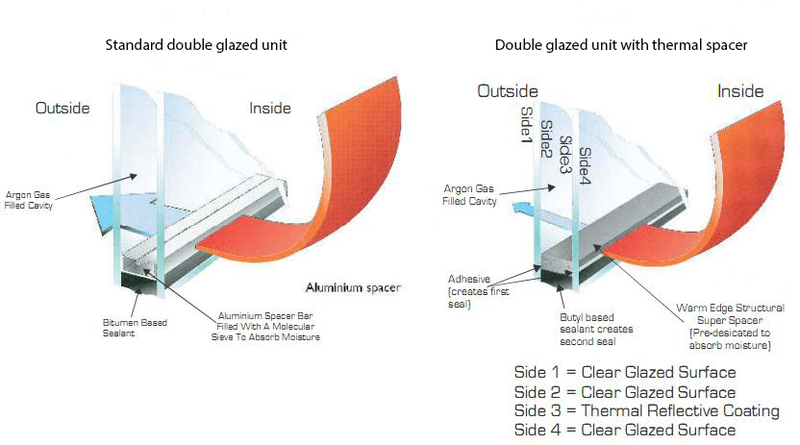 Thermally broken frame with double glazed glass (with thermal spacer) is a must have with new building. This simple configuration allows for passive heating of living areas during the day and cooler, southerly sleeping area. 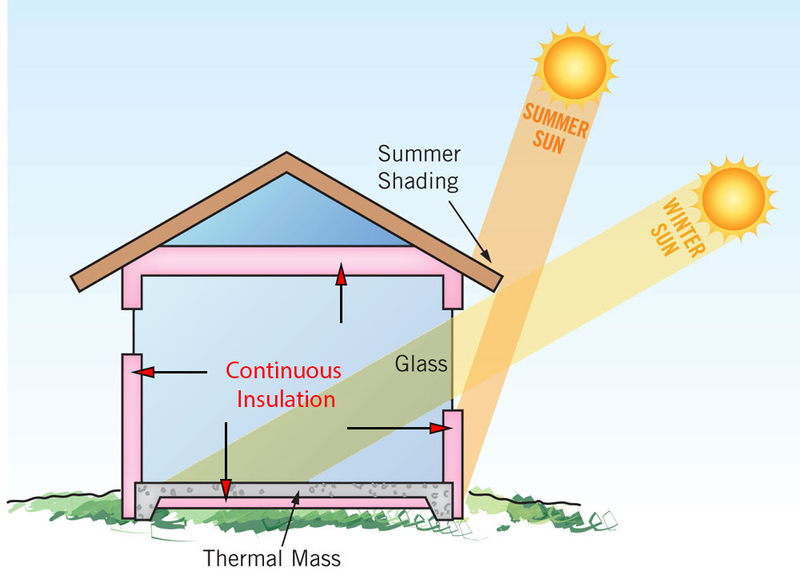 Thermal mass is the ability of a material to absorb and store heat energy. A lot of heat energy is required to change the temperature of high density materials like concrete, bricks and tiles. They are therefore said to have high thermal mass. Lightweight materials such as timber have low thermal mass. Appropriate use of thermal mass throughout your home can make a big difference to comfort and heating and cooling bills. Correctly used, the thermal mass, moderates internal temperatures by averaging out diurnal (day−night) extremes. This increases comfort and reduces energy costs. Poor use of thermal mass can exacerbate the worst extremes of the climate and can be a huge energy and comfort liability. It can radiate heat to you all night as you attempt to sleep during a summer heatwave or absorb all the heat you produce on a winter night. Allow thermal mass to absorb heat during the day from direct sunlight or from radiant heaters. It re-radiates this warmth back into the home throughout the night. 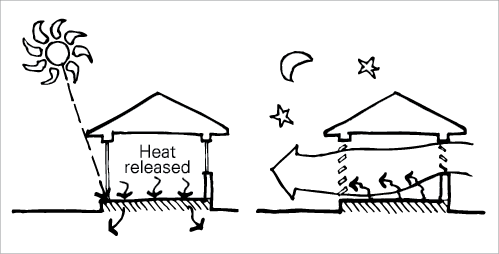 Allow cool night breezes and/or convection currents to pass over the thermal mass, drawing out all the stored energy. During the day protect the thermal mass from excess summer sun with shading and insulation if required.